Bird Central - Mirrored Panoramic In-House Window Feeder - Window Bird Feeders - window bird feeders, bay window feeders, in-house window bird feeders, cedar and maple construction - fun for the whole family, especially kids! One-way mirrored panel lets you see the birds up-close and they can’t see you. The Panoramic Feeder is made from furniture quality Western Red Cedar. Designed to sit inside the house, the feeder is easy to install. 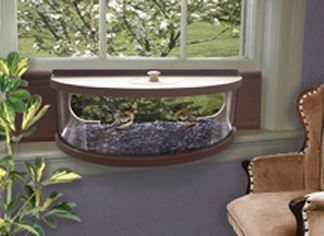 With our unique dove-tailed wood side panels, simply place the feeder on the windowsill and slide the panels out to fit the window. One inch thick wooden side panels provide great insulation and security. For added security, the design of the feeder allows you to completely close and lock your window with the feeder in place. Feeder fits most double hung windows from 26 inches to 36 inches wide. Easy to fill and clean from inside your home. Like all of Coveside Conservation Products, the Mirrored Panoramic Window Feeder is made in the USA. Holds approximately 5 to 6 cups of seed. Dimensions: 24 in. x 7-1/4 in. x 9-1/2 in.